A gamekeeper who shot two protected owls on a Cumbrian grouse moor has been convicted and ordered to pay more than £1,200 in fines and other costs. Timothy Cowin killed the short-eared owls on the Whernside Estate in the Yorkshire Dales national park. The area has gained an unenviable reputation as a blackspot for raptor persecution. The offences took place on an area used for driven grouse shooting. Cowin, 44, pleaded guilty of two offences of intentionally killing the two birds, which are protected by law, and to possessing an item capable of being used to commit offences against wild birds. He was fined £400 on each count of the killings and £200 for possessing the calling device. He was ordered to pay costs of £170 and a £40 surcharge. The bench at Lancaster Magistrates Court ordered that the calling device be forfeited. On 19 April 2017, Royal Society for the Protection of Birds officers visited the area and Cowin was seen walking on the moor holding a gun. An RSPB officer saw Cowin shoot and kill two short-eared owls before disposing of their bodies on the moor. The police were called immediately and, after a pursuit on foot, Cowin was arrested. Both owl corpses were recovered, and a post-mortem examination confirmed they had been shot. A ‘FoxPro’ calling device – a type of electronic sound luring device – was also found in Cowin’s vehicle and seized. The device was later examined and found to have had the calls of birds of prey added to the device. 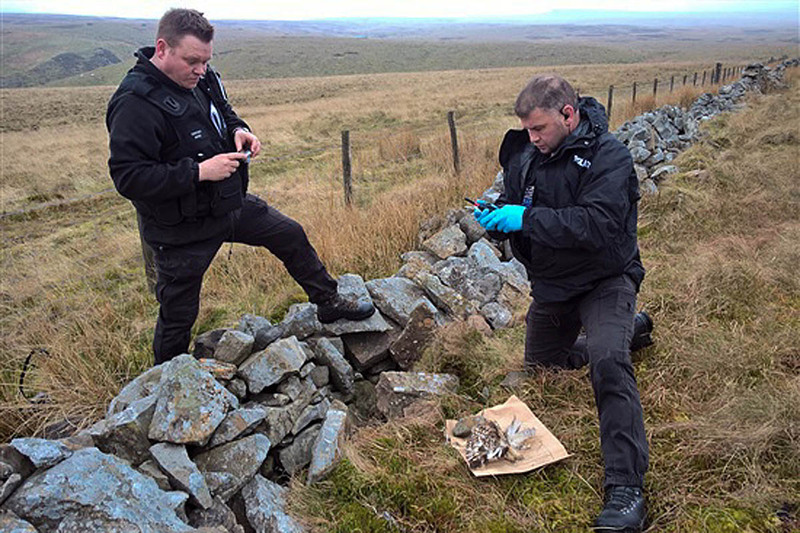 After the hearing, Sergeant Kevin Kelly, from North Yorkshire Police’s rural taskforce, who worked on the investigation with the RSPB, said: “Following this conviction, I feel like we have taken another step forward addressing bird crime. “This is the first courtroom conviction for a raptor persecution case in a number of years and I’m proud of my officers who have persevered through this investigation. In February this year, North Yorkshire Police launched a campaign with the RSPB to counter raptor persecution in its area, ironically named Operation Owl. Guy Shorrock, RSPB senior investigations officer, said: “Over the years we have had a number of very disturbing reports from people within the shooting industry alleging widespread and systematic killing of short-eared owls on grouse moors in the north of England. Sgt Kelly added: “I appreciate there will be varying degrees of frustration levelled at this case and the outcome. None more so than myself as this undermines the excellent work we have been doing with Operation Owl whereby police and investigators are bringing landowners, land managers, gamekeepers, around the table to help eradicate persecution. “This whole situation could have been avoided by good practice and accountability – something that was clearly devoid with Cowin in April 2017. Members of the public who have information or concerns about raptor persecution or any other types of rural crime are urged to contact North Yorkshire Police on 101. The RSPB recently launched a confidential Raptor Crime Hotline on 0300 999 0101. If you love the outdoors, have you ever wondered why when you walk through the hills and dales you almost never see any wildlife. This is why, the gamekeepers kill everything that COULD affect the grouse yields. The estates hide behind the the, he was operating outside our guidelines, if that’s the case how can you trust the estates when they can’t control their employees. The fine will just get paid by his wildlife murederung employers! Spotted short eared owlets on a few occasions this summer in the Dales, magical. Hoping there is less interference from the land owners - but unfortunately, it seems they get away with this and a lot more most of the time. 1. Good, at last someone has been prosecuted. 2. The fines were high enough. 3. The felon should be banned for life from owning, possessing or firing any firearm. 4. He will have been working under the instruction of the grouse moor's owner(s) so they should have been prosecuted as well - presumed guilty unless they can categorically prove beyond all reasonable doubt that they had not instructed him to shoot birds of prey seen on the estate. 5. All shooting on the Whernside Estate should be banned for a minimum period of 3 years. 6. Any breach of points 3 or 5 should be met by prison sentences. Good news, though it took a treck through several courts to finally get him convicted. I wonder who paid for his legal representation. Scotland has a law of vicarious liability under which the employer can be prosecuted - I'm not sure how many successful prosecutions have been made, but at least it's on the statute book. It's high time that the rest of the UK had a similar law, so that the shooting industry can be properly held to account. There is a detailed desription of how he was caught on the RSPB site - try Googling with 'whernside estate shooting rspb'. It makes a good read and excellent to see the determined police response. Well done them and the RSPB officers. Wow £1200 fine. All the effort into making the arrest and taking it to court, the countless birds of prey that fella has no doubt killed in the past, £1200 compared to how much money is earned from grouse shoots. £1200 really??? Once the courts start to issue jail sentences for such offences then this may be taken seriously until then £1200 is just an occupational hazard to the gamekeepers and landowners. Shame on Tim Cowin and Whernside Estate. Unbelievably low fine,but at least his employers should terminate his employment now. One other thought - how about making devices like the Foxpro illegal. As with duck calls, their only use must be for the purpose of shooting the particular bird. I wonder, did this loathsome individual have his shotgun licence revoked as a result of his conviction? If not, why not? Did he even have a shotgun licence? Was his weapon confiscated by the police? The answer is to license shooting and revoke the licenses of those estates where raptor persecution is a problem. That's what's being discussed in Scotland. The estates hide behind the wayward gillies and get away with it.